Welcome to the live blog for the second rehearsal of the second semi-final. This is an important one as the juries around will Europe will make their decisions based on these performances. We should therefore see some good ones. #Join us and see what you think. We open with clips of the first semi-final in an X-Factor style. All the lights, dancing, cheering and all the colour. We then cut to a local scene of a family driving to the venue. Past one of the many extra buses laid on to ferry people there. We see colourful cubes and lights in the sky. we move to inside the arena and have violinists in boxes. They’re carried around the stage by dancers in an interpretative mood. They dance to a famous piece of music – that famous I can’t actually name it! Our dancers leave the stage and are replaced by our three hosts, who introduce themselves in a very similar style to Tuesday night. Eurovision is a buffet apparently. Malta open the show. Firelight are all smiles and seem really confident. The vocal is good. They’re all in tune and it blends well. There is a big cheer from the crowd in the arena and also in the press room. Israel’s postcard involves salt and string. Mei is in a black outfit in a plunging neckline. She has taken this down a key to the bottom end of her vocal range. The dance routing before the second verse is very slick. The song moves along nicely and she holds the long notes towards the end very well. Norway’s Carl has a postcard made from a window frame. Our crowd appears to have been asked to put their mobile phone lights on. He’s in a dark suit and we start with some close camera work, that I think this song needs throughout. He appears a little nervous and is concentrating on one place. For the second verse we see the four violinists and we get some wider shots. We finish with close shots. It gets a big cheer from the press room. Wine is the theme of Georgia’s postcard. The drummer of The Shin has stripey drumsticks. It’s an interesting song to describe. Mariko is in a bright green dress which looks interesting when compared to her long red locks of hair. And of course the parachutist is striking in black and yellow. For the last chorus of the song the stage goes green. More big cheers from the audience. Poland has a graphic equaliser for its postcard. We get immediately ethnic with traditional motifs behin Cleo. She smoulders around the stage, and we cut from time to time to the girls washing clothes and churning butter. For the instrumental break the stage goes red and the dancing is choreographed very well. They are all definitely shaking what their mothers gave them. Lots of cheering for this. We go to our first commercial break. More Eurovision records championed in the field of special effects, dancing and clapping! What’s the record song for clapping? Find out tomorrow night, but it’s from Austria. Coincidentally, next on is Austria and Conchita has a clothing themed postcard. The long opening shot has her in silhouette so it’s sometime before we see her. That shot then pans back. With the backdrop of gold, flames and lights the effect works, especially when she appears to have wings of flame coming from her shoulders. The wind machine is used for the final chorus and we get pyros at the end. This gets the best reception so far. Vilija from Lithuanis has a postcard using a large amount of umbrellas. She wears another striking outfit of a black tutu-based dress that has elements of royal blue. The choreography is a very large part of the song and, while slick, maybe a bit too progressive for some. The middle slow part has a very well thought out camera angles. It gets a big cheer. Finland’s postcard uses snow and ice. They’re in their silver suits and it starts dark, focusing on the lead singer Topi. As it builds to the chorus we get red lights, then huge amounts of white strobe lighting. It works and the large stage really fits the big big sound we get from it. Big applause from the crowd. Kasey uses balloons for the Irish postcard. She’s on stage in a long gold frock and black band across her forehead. She walks around the stage and the shots here introduce the dancers. For the chorus we get huge amounts of celtic symbols. Kasey interacts with the camera – this is a TV show after all – and the nerves that were obvious a week ago have gone. This was as good as it could be. Teo has ice hockey pucks in his postcard. He’s in a dark suit and open-neked white shirt. There is a lot of charisma going on here. And rather than hiding his backing singers away, he has them dancing with him. It works really well and even though his English diction might not be the greatest, this song gets sold very well. And the final shot has him kicking the camera as per his preview video. big cheers here. Tijana uses make up in her postcard. The stage starts with contrasting black and white which mirrors her costume. The spectacles have gone from her, but the backing singers have theirs. It’s very catchy and helpfully well away from the Israeli song that has similar overtones. Her single backing dancer is effective without overshadowing her and the backing singers get in on the act too. This is a definite crowd pleaser. Switzerland has dominoes for the postcard. Sebalter continues to get the crowd going. It’s making plenty of people in the press centre clap slong. There’s lots of star and comet-like effects in the backdrop, and a curtain of falling fireworks for the chorus before the violin instrumental break. we can tell the crowd in the hall loves this song and they are all enjoying what they’re doing. Big cheers all round. Time for another ad break. We see the crystal microphone trophy, complete with logo and little Danish flag. The next Eurovision record involves lip licks. Who licks their lips the most? Find out when you see the show tomorrow night. Next on is Greece and the postcard takes us to a shell-covered beach. It starts simple and immediately gets the crowd with its bouncy bouncy message. We have close-up shots for the rap and verses and even quick shots amongst the crowd. For the final chorus there’s a trampolinist in slo-mo whilst they mount the trampoline with him. One of the biggest reactions so far, from both press centre and audience. Tinkara’s postcard is at a library and uses lots of books. She wears an electric blue dress and doesn’t hide the backing singers away. We get interesting shots of spinning circles on the stage’s floor. The round and round theme continues with lots of camera shots spinning around Tinkara. Sadly, she doesn’t quite hit all the notes for the final chorus, although she recovers in time for the end. Finally, Romania’s postcard is at night and involves light and water. Blue is the initial theme for the stage. Ovi starts alone and then we see the hologram of Paula. She disappears and the reappears elsewhere. The stage is full of lights. For the second verse, Ovi moves to his circular keyboard to mime the piano sounds. But they continue when he moves away. he gives us some moves before flame pyros appear at the front of the stage. There is lots more lighting. More cheers, although that might be because it’s the final song. All the songs over, and it’s time for a quick recap. These 15 second clips can make or break a song’s chances, so we hope the delegations have chosen well. I must add that the remaining five are all good too, and it will be close. A lot has been made of Jessica Mauboy singing on the Eurovision stage, so Australia is airlifted north and dropped on Europe. We get a pastiche of all things Australian – sport, beach, beer – that sort of thing. Then we see Jessica. She’s from Darwin. 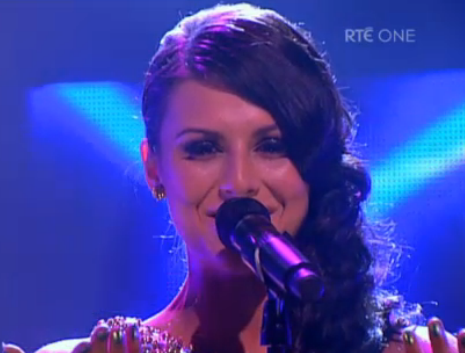 Her song is a big mid-tempo one that wouldn’t look out of place in a national final. More recapping of the songs takes about four minutes. We see some of the videos people have sent in of themselves dancing, all hoping to be part of the experience. Some of them are there on stage. There are some very nice touches. we understand a girl from Ireland is among them. You know how the rest works. Ten ‘envelopes’ are opened, and five countries will go home. Tune in tomorrow for more news from the Eurovision Song Contest. The show is on from 21:00 CET. How come you remain so impartial when commenting on each country and give positive feedback. But when it comes to Ireland……you’re so negative….?????? ?